The fake bunker entrance of Bunk’Art 2. This is a surprising statement considering the fact that the National Historical Museum already contains a pavilion dedicated to the “communist terror.” Also, as he might have noticed across his office, there is large monument, including a bunker: Ardian Isufi and Fatos Lubonja’s “Postbllok” memorial. And then in Shkodra, there is the Site of Witness and Memory, another museum that deals with the heritage of the communist past. So, if anything, Bunk’Art 2 is at least the fourth of such memorials, and, in many ways, the least successful. The call of the muezzin resounds as I approach the fake bunker. On the right, Bollino has installed a mini watchtower with fake barbed wire, acting as an advertisement for the oversized dome next to it. The discrepancy in proportion gives the whole installation something absurdist, an absurdism and lack of comprehension that continues inside. The inside of the entrance bunker. I enter the cupola of the entrance bunker, which on the inside is filled with the portrait shots of the victims of the totalitarian regime of Enver Hoxha. 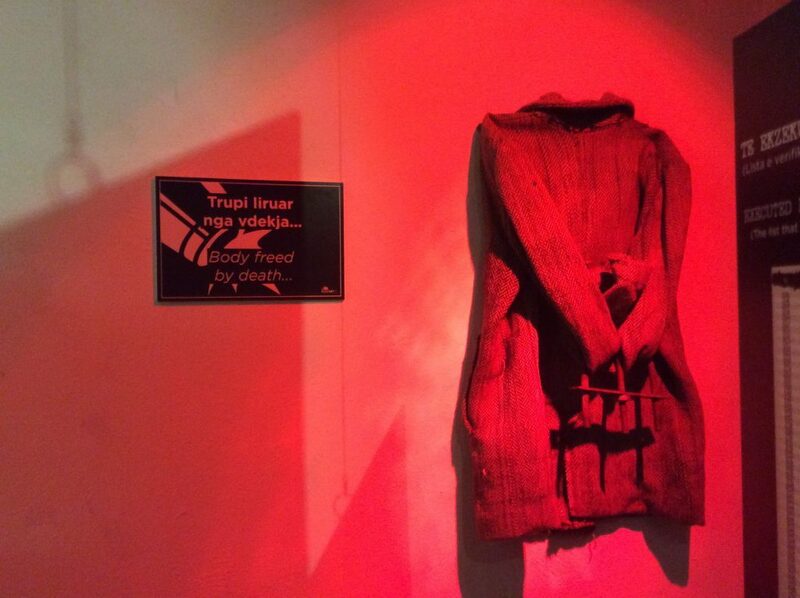 The installation is a cheap rip-off from World Holocaust Remembrance Center Yad Vashem. A bad copy of a communist bunker filled with a bad copy of a commemorative installation for Jewish victims. Good start. 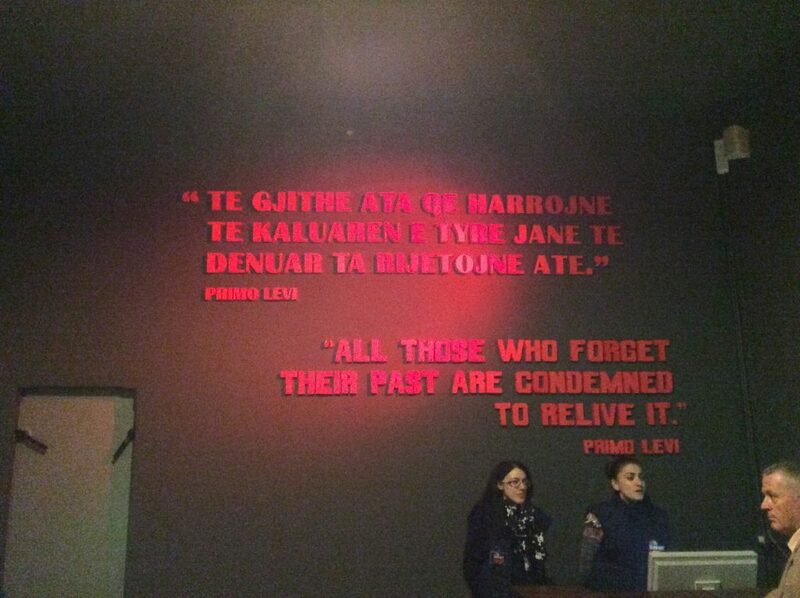 Several people in line in front of me turn away once they hear the entrance fee is 500 lekë, but downstairs I understand that the entrance is free for those persecuted by the former regime. “Do I need to show proof of that?,” and elderly gentleman asks the girl behind counter. “If you have been persecuted,” she answers, “you can walk right through.” The gentleman enters. Above the counter is a giant quote of Primo Levi: “All those who forget their past are condemned to relive it.” Prime Minister Rama has on several occasions used it in public, and even gave it as a title to his inaugural speech, in which he arrogantly called upon his critics to “shut up.” Unfortunately for Rama and his so-called intellect, Primo Levi never said such a thing; it is from George Santayana’s The Life of Reason. The exact quote is “Those who cannot remember the past are condemned to repeat it,” although there are many different paraphrases (because it’s a cliché). 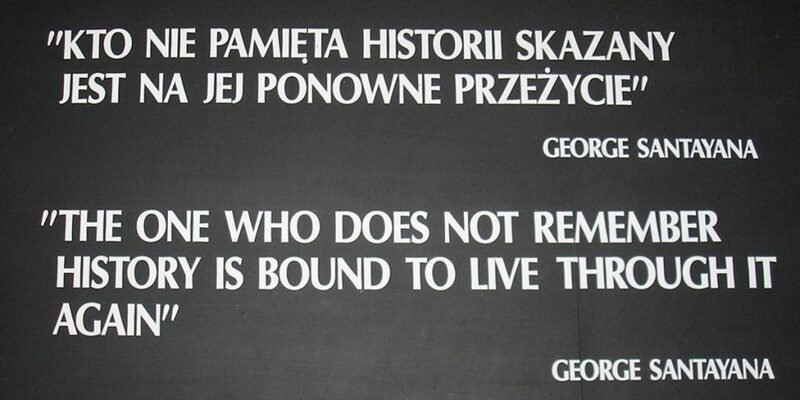 It is, for example, inscribed, and correctly attributed, on a plaque in Auschwitz. A photograph of the plaque outside of the Auschwitz concentration camp. Source: Flickr/Jorge González. This is not the only glaring error. A sign across the counter informs me that I am in the “former nuclear bunker of the Ministry of Interior Affairs.” Also this is incorrect. Although the structure may have withstood artillery fire, it wouldn’t have been able to withstand an atomic blast, and was, in fact, never built for that purpose. Anyhow, whatever makes the tourists happy! But these two giant gaffes at entrance beg the question: what else did they get wrong? Most rooms, in spite of their signs which suggest some form of coherence, are in fact ahistorical collages of often unrelated objects. For example, one room contains 1) information about the National Criminal Forensics Lab from 1946–2000 (why 2000? ); 2) a video displaying the student uprisings from 1990 (with large Bunk’Art 2 logo in the lower left corner); and 3) against another wall some undefined radio equipment with a Chinese manual(?) on top of it. Another room features a half-open door behind which a man is whispering a confession, a bunkbed, and table, and a Russian map of Berlin. Where am I? Rama stated that we are supposed to remember with “mind, heart, and eyes,” but he has certainly forgotten the ears. The audioscape inside the bunker is a nearly unbearable cacophony. Apart from the many different videos playing in adjacent rooms (all with their doors open), there are recordings of victims’ names with ominous background sounds, the national anthem, air raid sirens, pounding heartbeats, radio announcements, typsewriter sounds, and sentimental music coming from all directions. And everywhere I am informed about the available “augmented reality experience” through the free Bunk’Art app, which, together with the other audio-visual input presented, must no doubt be seizure inducing. An exhibit in Bunk’Art 2. The disorienting sound and the haphazard organization of space and time make that different eras – fascist, communist, democratic – all seem to blend into one giant ahistorical soup, up to the point that certain interventions seem to lack any form of sense. For example, what is that firehose suspended from the ceiling? And what is a “Body freed by death…”? What is consistent in the exposé, however, is that literally everything in the bunker has been branded. Every exhibit, every video, even signs stating that “the weapons displayed in this room have been deactivated and turned into a museum object” or that I need to “STOP SMOKING” carry the Bunk’Art 2 logo. What is equally noticeable is the dismal quality of the language used on the signs, both the Albanian and the English. For example: “It was done in advanced stages of torture when wounds started to pitch choirs.” Can anyone tell me what it means to “pitch choirs”? Another one: “The whip was unleashed to the defendants&#39;s [sic] neck in the form the serpent quickly gathers around a tree.” Did anyone who speaks human language check these? Then finally, another – unintentionally funny – torture method: “23. Releasing a drop of water on the head.” If this is supposed to be a “tourist attraction,” their impressions of the Sigurimi’s torture methods may not be entirely historically accurate. There is, naturally, space for “contemporary” art in all of this, as if the experience of Bollino’s disneyfication of the past was not enough. Rajmonda Zajmi Avignon made an “artistic installation” entitled “Monster of the Dictatorship.” I admit that as a sculpture it certainly beats Edi Rama’s recent ceramic work, but all in all it is a rather infantile collage of found scrap metal and trash. The wall text tells me that “The monsters use media as smokescreens for their crimes.” Perhaps one of the few true sentences in the entire exhibition. The artistic installation “Friendship,” of Yllka Gjollesha and Rubin Beqo is closed, or maybe I couldn’t see or hear it. The wall text speaks of “A Chinese friend of us,” who “maybe will help us to shed light on these plates gramophone music contain.” Rubin, if you read this, give me a call anytime! Furthermore there is a video work by Driant Zeneli. Although certainly the best work inside, it is completely unrelated to anything else and somewhat scandalous in how poetic tries to be amid all the “terror of communism.” Finally, the installation of Ledia Kostandini, “Incube,” is rather underwhelming, with no-so-“blinding” lights in otherwise empty rooms. Neither “hallucinatory conveyance” nor “surreal environment” to be caused by this work, although by the time I end up at Kostandini’s work, I have already experienced both. There is absolutely nothing in Bunk’Art 2 to explain me the relevance of any of the objects, films, photographs, sounds, and art works that I am presented with for some greater narrative. This is the main, and most problematic issue with the exhibition. Certainly no curator of any merit has at any point been involved in any part of this project. All textual elements are purely descriptive and there is not a single moment where anyone (curator or otherwise) offers an interpretation. And this absence of interpretation is nothing else but a sign of the absence of thought. Bunk’Art 2 makes the communist past so incomprehensible that no one will dare to ask a single critical question – because they wouldn’t know where to start. Bunk’Art 2 is open daily from 10:00–19:00. Piece originally published at Exit. Republished with permission of the author.